Many utility rate schedules include a demand charge that reflects the highest level of electricity supplied at one time during a billing period. Therefore, Verdigris sends a peak demand alert when your facility's energy usage approaches or exceeds its historical peak level, in order to help you manage and mitigate demand charges. Review the checklist of common contributions and triggers to a peak demand alert. Were any appliances left on unintentionally? 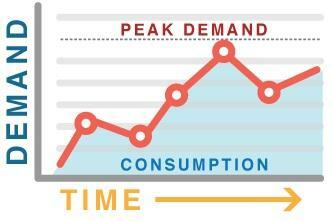 What can you do to reduce your peak demand charges? Use energy at a steady pace. When possible, reschedule energy-intensive activities at lower-load periods to avoid demand spikes. Evaluate your pricing options. Some utilities offer rate schedules with lower peak demand charges during certain times of the day. Install energy-efficient or downsized equipment to use less electricity. Invest in a solar energy system and/or an energy storage system to offset electricity costs.